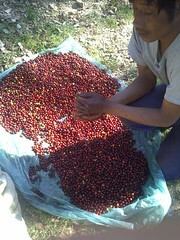 With the Sao Judas now sold out, we are soon offering the Cup of Excellence winner from Guatamala, El Injerto. We are slowly determining the ultimate roast profile that tingles our taste buds, and this should be finalized by the 20th. The good news is that we have 130kgs so this Limited Edition Coffee may last a little longer. The coffee from Finca El Injerto, is grown surrounded by a thousand-year-old virgin forest. This gives the farm its special climate and adequate conditions to have clean water that springs directly from the mountains. The coffee is grown between 1,500 and 2,000 m and has been placed high up in the Cup Of Excellence awards four years running, winning it in 2012. On Saturday 20 April, we will have 2 ways to taste the new coffee, between 10am and 12am at Buitenverwachting. So pop in. Although we do not sell any coffee grown in South Africa we were introduced to Crown Coffees. They will also be selling and allowing for tasting on the 20th April at the tasting day between 10am and 12am. Chad will be on hand to answer any questions. The coffee in general is naturally sweet and has a rich caramel taste; this general taste has a lot of variants as the flavours vary according to the day on which the cherries were picked. There are now seven thousand trees in the orchard that were grafted from the mother tree, which was found growing naturally in the forest on the farm and is suspected to have arrived when the area was being used to grow tea and farmers experimented with coffee this means the mother plants genes would have been quite pure as they would not have been as mixed as the coffee trees of today.